Hello Loves. 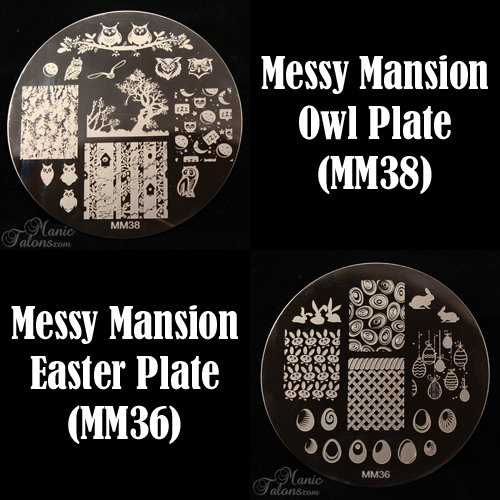 I have two new Messy Mansion plates to show you today: the Easter plate and the Owl plate. I know it's a little late for Easter, but I do have a sweet little mani to show you using this plate that isn't very Eastery. (Is that even a word?) And the owl plate is pretty fabulous! Let's start with the MM36, aka the Easter plate. This plate consists of eggs and bunnies galore with a pretty amazing basket image to seal the deal. I wanted to do a video on these, but I couldn't catch a moment when the boys were in bed to get it done, so I took photos of my first test stamps instead. These are my very first attempts for various images on the plate. I apologize for the glare in the upper left of each image. I couldn't eliminate all of the reflections on the polish no matter how hard I tried. The actual transfers in those areas are solid. As you can see, I got a small skip in the nose of the bunny in the upper left image. I did a second test outside of the light box and did not get the skip, so that is a user error. I am very pleased with the basket image and the bunny faces. Check out those eyes! The egg image is a bit tricky. I was able to get a transfer that I was happy with outside of my light box, but it did take a few tries. With that said, I find this to be the case a lot of the time with fine detail images. Overall, I love this plate and can't wait to use it for Easter next year! So, how about that not-so-Easter mani I mentioned? Ok, I guess it could be an Easter mani, but it doesn't have to be! I stamped the basket image from MM36 in Mundo de Unas White over a base of Couture Private Jet (I'll share the swatch of Private Jet at the end of the post). I then freehanded some messy roses on the tips with Couture Oui Madame, Ooh La La French, Oh So Glam and Aloe Very (swatched previously). Now for MM38, aka the Owl plate. I am more than a little excited about this one! So many adorable little owls to choose from! 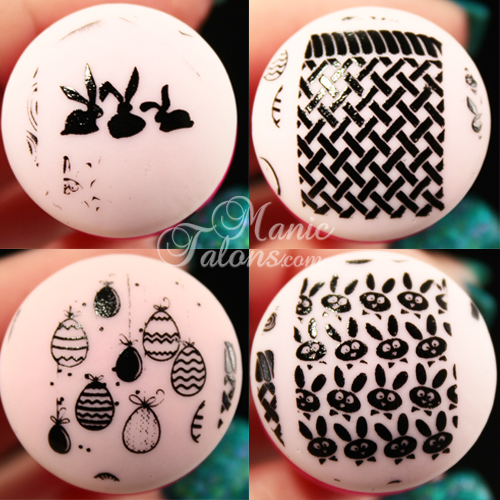 As with the Easter plate, I took a few shots of my test stamps. I am quite pleased with the detail on this plate. As you can see, I did get a few skips in the first image (upper left), but I'm pretty sure those are user error as they were not duplicated on every nail in one of the manicures I have to show you. You'll notice I didn't test stamp the two owls on the limb or the trees with the bird houses. That's because I couldn't resist using them right away! They're just so freaking adorable! 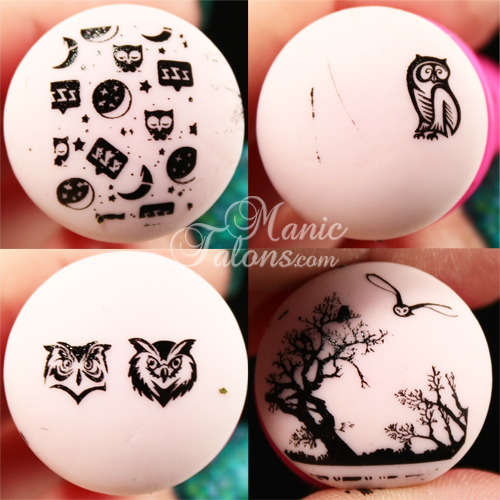 When I test stamped this plate, I realized I just couldn't complete this post without showing you those sleepy little owls stamped in white over a blue base. Would this not be perfect for a baby shower? For this one, I used Couture Naughty-Cal for the base and stamped with Mundo de Unas White. Please note that the base color is not accurate in the photo above. I know I rave about my Messy Mansion plates a lot, but they really do deserve all of the love I give them. They are high quality, I never have to stretch an image, and Julia's designs are fabulous! Every time I think I have acquired all of the ones I can't live without, she comes out with a new design that blows me away and gets added to my "must have" list. While they do ship from Australia, I have found that delivery times to the U.S. are usually quite fast for international shipping. So far I have always received my plates within 5-10 days of ordering. The customer service is impeccable as well! The plates I have shown you today are press samples that were provided by Messy Mansion for my honest review, but I have purchased many as well and have never had an issue with delivery or quality. I just placed an order for two more plates last week and am anxiously awaiting their arrival. Now if she could just find a way to get her LeadLight Lacquers out of Australia and onto my nails, I would be in Heaven! As promised, here are the swatches for the base colors I used in the manicures above. Couture Center Stage is a burnt orange base that is loaded with golden shimmer. I found this one very easy to apply - no streaks and opaque in two coats. As usual, I swatched three just to be consistent. Couture Private Jet is a delicate grey cream. This one did require my usual three coats to be fully opaque. 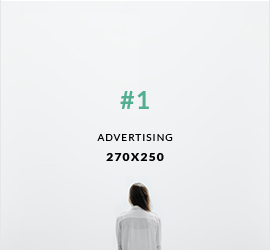 Depending on how thin you apply each layer, you may find it to be opaque in two. Finally, Couture Naughty-cal is a muted blue cream with lavender tones. I swatched this one before but realized when I put it on again that I failed to shake it well before the previous swatch, thus resulting in an inaccurate color representation. The photo below is accurate to the color of the gel when the pigments are properly distributed. What do you think of the Messy Mansion Easter and Owl plates? Do you need them? Are there other Messy Mansion plates you can't wait to get your hands on? I'm eagerly awaiting delivery of the Lace plate and the Scriptorium plate right now! They should be here within the next week and I can't wait to show them to you. Also, check back next week for swatches of Lily Anna 09 and the Messy Mansion Pirate plate! *The stamping plates featured in this post were provided by Messy Mansion for my honest review. The gel polishes swatched in this post were provided by Couture Gel Nail Polish for my honest review. I love that owl plate. But then, I used to obsessively watch barn owl webcam boxes - adults raising their owlets. I can believe that it is very popular! I haven't gotten into stamping yet but most likely will. 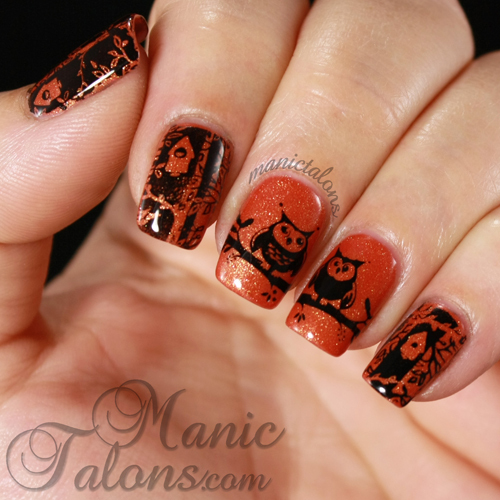 You and others show some amazing manis with stamping. lol, I don't think I am going to be happy just applying one polish for very much longer! Thanks for showing these plates, manis and the beautiful polishes - and for the terrific photos! The owl plate is so cute and a must have for me now, too. 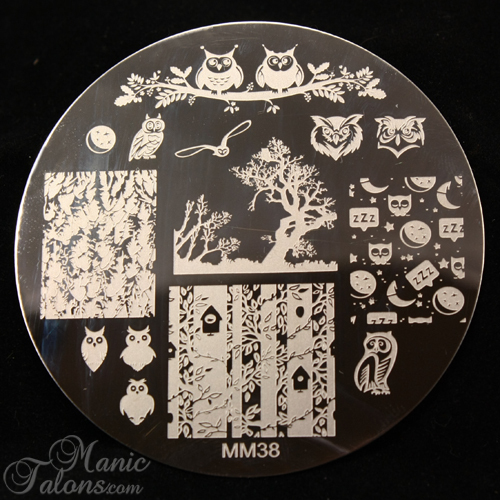 I got the MM forest plate mainly for the cute owls on that one. This plate is just more of a good thing. I've been eyeing the French plate. I agree with the shipping and the fabulous customer service. I tried stamping with some Bundle Monster plates and couldn't get any of the images I liked to work. I got pretty bummed out, as I absolutely LOVE what you can do with them. 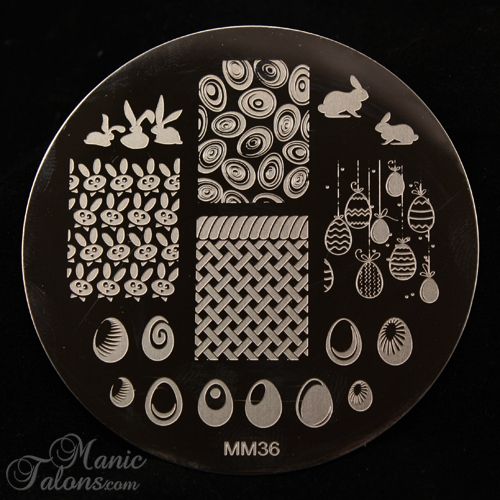 I'm thinking I need to give MM plates a try - they have some gorgeous images that I'm dying for. Question - what kind of stamper do you use? I currently have a Konad Nail Art Double Ended Stamper And Scraper and am not sure if that's part of my problem.